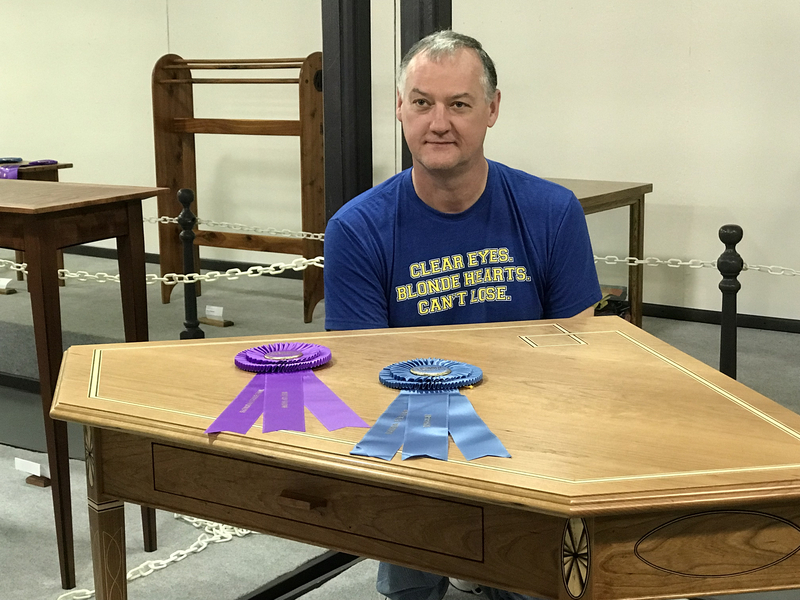 As I mentioned in this previous post, I was able to attend the judging event for woodworking projects at the Florida State Fair. And boy, did I learn a lot. This year, the woodworking judge was John Stine. His company, Stine Custom Woodworks, LLC, creates a lot of artistic, creative pieces for commercial and private commissions. He is highly qualified to be a judge. He had judged all of the projects on the previous day and made his comments on the judging sheets. On this day, he went around to each project and presented his comments to the woodworker. His personal demeanor was pleasant and very helpful to those displaying their projects at the fair. John was a stickler for finishing. “A poor finish will overwhelm the design and presentation,” he said. Some projects were just short of his standards for a quality finish. Most had to do with inadequate sanding. John likes to wet-sand his final coat with 1000 or 2500-grit sandpaper and then apply a wax or the final finish coat. He likes to add a little tint or color to the finish for patina (even on “natural” pieces) to make it an original piece. Treating all of the “unseen” parts of the project with the same sanding and finishing technique was high on John’s list also. For example, the inside and outside of drawers, including the drawer bottoms. During his comments on one project, the question came up about the use of polyurethane. John prefers to stay away from it. And one woodworker piped up, “Minwax should be thrown in the trash.” I can’t say I disagree with either of these statements. John goes on to say that the type of finish depends on the project, the materials it’s made from, and its intended use. There was a hall table on display that had a highly figured veneered top. John was a little disappointed in the finish. “Figured wood can really sing if it’s finished properly.” More sanding. And speaking of sanding, John mentioned that, as woodworkers, we need to take extra care and time to remove all machining marks from all surfaces. This includes scratches left from sanding, planing marks, and saw marks. And to give the project a pleasant “feel” when it’s touched, John likes to lightly ease all of the sharp corners and edges. John made a few comments about the overall design of some of the projects. He suggested using contrasting wood species for visual impact and a focal point. And little things like adding drawer stops to drawers add a practical feature that helps your project stand out. All in all, listening to John’s comments was a great lesson on how I can improve on my woodworking skills on future projects. John Kennedy with a Florida State Fair first: Best of Show and a Blue Ribbon. Before the judge arrived I made several interesting observations. First, only 20+ projects were submitted in the woodworking category. I don’t have a frame of reference for how this compares to most state fairs, but it seemed to me that for a state-wide event, there would be more projects. This table symbolizes the lack of youth projects in woodworking. The second thing I noticed was the absence of younger woodworkers. Everyone (with one or two exceptions) had to be 55+ years old. I guess that’s to be expected in a state known for retirement living. But I noticed the same trend at the Iowa State Fair when I resided in Des Moines for ten years. To me, it’s disappointing. One of my lifelong goals is to encourage the younger generations to work with their hands and be creative with something tangible that they can call their own. These observations got me to thinking. Why aren’t there more presenters in the woodworking category? Local woodworking clubs are always begging their members to take a project or two to the state fair. Is it our innate fear of embarrassment that our project isn’t good enough? Is it fear of what the judge might have to say? Do we feel our work isn’t worthy of being displayed at the state fair? Let’s analyze this objectively. First of all, get your kids and grandkids in the workshop. In building projects for one of my recent books, several of my grandkids were helping with sanding, painting, and a number of other tasks. It wasn’t that they were necessarily completing a project but simply being exposed to tools and how they work. Eventually young ones and teens can start designing and building their own projects to present at the local county and possibly state fair. As for the rest of us, what is there to be afraid of? Realistically, only your close friends and family members are going to know your project and they don’t care about all of the mistakes you may have made in the piece. They’ll be proud of you for being willing to have your project on display. As for the judges comments, let’s look at from the perspective of constructive criticism to help improve your woodworking and not a condemnation of how you built your project. We can take criticisms too personally. They’re opportunities for growth. And who knows…your project could win a blue ribbon! So we need to be forward-thinking as we work in the shop. Can the project we are working on (or the next one) be a potential project for display at the local fair? We need to get over our fear and make it happen. 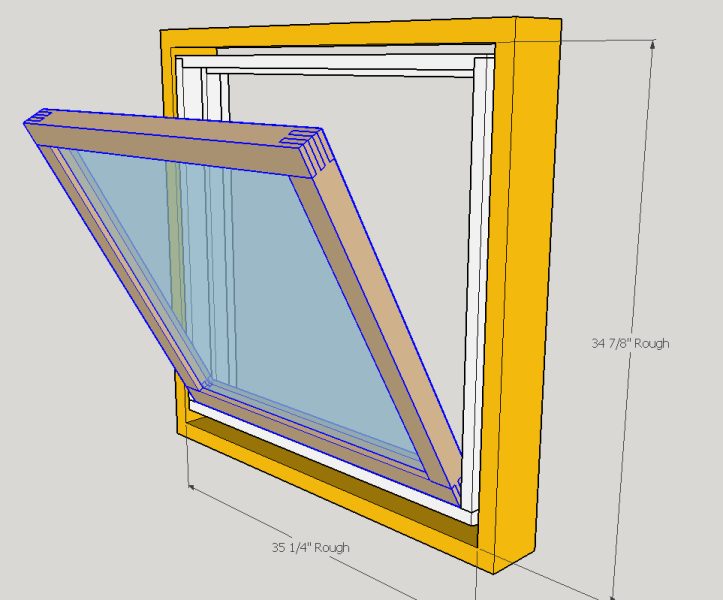 In this previous post, I talked about how I had to design a hopper-style window from scratch. I had never built a window before, so it was a challenging project. Long before social media became commonplace, there were list servers on the internet. These were text-only email lists that you had to subscribe to. Everyone that subscribed had the ability to post to the list so that everyone on the list could see their post. It was a great way to get to know other like-minded folks that shared a common interest. One such listserv was OldTools. As a matter of fact, it’s still around and very active. I learned a lot off of that mailing list and got to know a lot of good folks. It’s a tremendous resource. But over the years, I’ve had to back off simply due to the sheer volume of emails and the time required to read them. Sometimes, to succeed at a project, you have to own the entire process. I have a ShopBot Desktop CNC machine in my shop. I was experimenting with it this weekend cutting a handwheel to be used on a light-duty benchtop woodworking vise. The toolpath files were developed by a friend of mine. It’s a two-sided part so there is a roughing and finishing pass on each side, for a total of four files (each pass a separate file). The toolpath files were set up to reference the center of the wheel as the origin of the X and Y axes. Since I was using a 1/4″-dia. ballnose bit, I drilled a 1/4″ hole through the center of the wheel blank (a 2″-thick piece of ash). This way, setting the origin point of the X and Y axes can be done by locating the cutting tool in the center hole. The Z axis was zeroed at the top of the blank. Routing one side of the handwheel using the supplied files presented no problems. Though both the roughing and finishing pass took a couple of hours to complete, it looked great. Both toolpaths included “tabs” at each of the four quadrants to hold the handwheel in place in the blank as material was removed. After routing one side, I flipped the blank over, again referencing the center hole as the origin of the X and Y axes. I started the roughing pass and all was looking great. Until the cutter cut through two of the tabs, which forced the handwheel to move inside the blank. I stopped the cutting and tried to figure out a way to complete the handwheel without scrapping it altogether. So I cut the rough handwheel from the blank, used double-sided tape to hold it to the CNC bed, and reset the origins of the Z, Y, and Z axes. After completing the final roughing and finishing pass, I had a complete handwheel. The only problem was, the X and Y origin was off just enough that the two sides didn’t quite match up. So I scrapped it. And started over. Another piece of firewood. I’ve got one blank left before I need to obtain some more lumber. What’s the main lesson here? For me, I was at the mercy of using files that my friend had supplied to me. They worked for him on another project, but for some reason, they weren’t working out so well for me. So I’m asking him for the original design files to see what I can do to regenerate the toolpath files. Or at least find out if I need to do something different on my end. I need to see if I can find another way to make the process more accurate and foolproof. And while I’m at it, I’m going to try to optimize the cutting speed so this one project doesn’t take half a day to cut. I’m also going to have him explain to me his thought process on developing the files so I’ll have a better understanding of the whole picture. If you’re in the business of woodworking, outsourcing some of your design work or parts can be a huge time-saver and eliminate a lot of headaches. But you need to own the entire process. What I mean is, you need to be intimately familiar with each phase of the project from the initial design sketches to delivery and installation. A sure way to wreck the budget and schedule is to be caught off-guard with an incorrect assumption from someone on your team or from an outside supplier. Stay on top of the project’s progress at every phase. 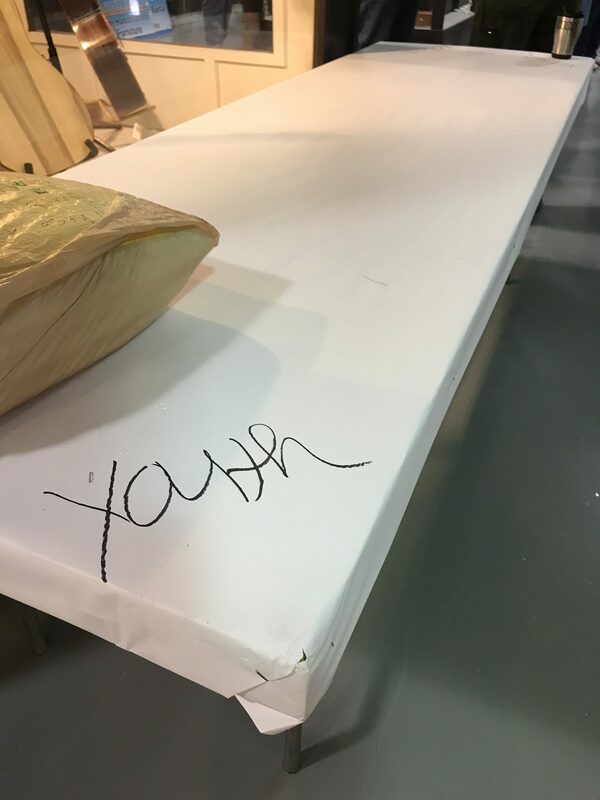 If you’re a hobbyist woodworker, owning the entire process means you’ve read and understand the plans you’re using to build the project before buying the lumber. Then you spend time selecting the best lumber for the project, taking care when milling it and fitting the joinery. Then you test out your finish on scrap material before applying it to your final project. No surprises. Years ago when I was consulting with architectural and engineering firms about their Computer-Aided Drafting (CAD) processes and procedures, I always preached the importance of backing up their data. Back then, hard drives for personal computers were very expensive and nowhere near as reliable as they are today. The only way to reliably back up the data was to copy it to an external tape or backup device. There was no “cloud” storage with automatic backups. One day as I was working on a long-term software project for a manufacturing firm, I was deep into programming some complicated software when my hard drive died. It suddenly dawned on me that I had not followed my own advice and backed up my hard drive any time recently. I immediately panicked and started to sweat. I realized all of my client files were on the hard drive. They were now gone. I even sent the hard drive off to a specialty company to see if they could recover any data. They could not. So I was forced to start over with a major portion of my software project, starting from scratch in a lot of instances. But you know, the software I finished was way better than what I had been working on when my hard drive crashed and burned. Early in my woodworking hobby I set about building a cabinet for my brother-in-law to house his stereo equipment and music collection. I was routing dadoes in the cabinet sides for the shelves. On one pass, I noticed the router motor slowing down. It didn’t take long for me to realize that the 3/8″-deep dado I was routing was now ramped deeper across the cabinet side and eventually routed through the 3/4″ plywood and into my workbench. The router bit had slipped out of the collet during the cut. My project was ruined. I turned out the lights and went to bed. Lying in bed that night I began to wonder — could I possibly make a patch to hide my mistake? So the next night, I spent hours fussing over the fit and grain pattern to create a plug that fit perfectly. I learned a lot. To this day, you have to look really hard to find the patch. As I spend more time in the workshop, I still occasionally make mistakes on projects. We all do. Sometimes the mistakes are minor and easy to fix. Sometimes it means cutting another part. And, at times, it means scrapping the project and starting over. When this happens, it’s normal to get angry at ourselves (or others), perhaps say a few choice words, or stomp out of the shop (or all of the above). Sometimes it’s hard to swallow our pride and admit to ourselves that our ideas aren’t going to work. I recently worked for a few hours on a small project and realized it wasn’t going to work, no matter what I did. So I put it aside and tackled it from a fresh perspective the next day. I was much happier with the results. What can we learn from these experiences? Sometimes catastrophic failures and mistakes can cost you dearly. Perhaps not always in financial terms, but in lost time and resources. But mistakes can make you take another look at what you were doing and rethink the problem. Often, what you come up with is a better solution than what you were working on. Yes, there are still times when something goes wrong and I simply turn the lights out in the shop and calmly call it a day. Tomorrow brings a fresh start. In the meantime, I give a lot of thought to what happened and why. And then I start thinking of ways not to let that mistake happen again. More often than not, the ultimate solution is miles ahead of where I would have been otherwise. Yes, mistakes can cost us dearly. But they can also be the best teacher. The toolbox you lug around on the job site is usually nothing more that a container for your tools. It’s a single-purpose necessity for keeping your most-often used tools handy. A creative group of guys have set out to redefine what a toolbox should be. They call it the Coolbox. They call it “The World’s Smartest Toolbox.” You can see in the box above how much they’ve raised through crowd-funding on IndieGoGo. Their original goal was to raise $50,000. You can see how much their product idea must be hitting home with a lot of folks to have far surpassed their goal by several times. It’s one of those “Why didn’t I think of that?” products. The Coolbox it’s loaded with features you’ve longed to have on the job site. It’s a USB charger for your phone or tablet. There’s an integrated tablet stand. It’s got Bluetooth speakers for cranking out your favorite tunes. A pass-through power strip supplies juice to your power tools. LED lighting floods the area with light so you can select and use the right tool. There’s a whiteboard in the lid for jotting down notes, dimensions, or a shopping list for supplies. Built-in batteries supply power to small tools and the clock when you’re not near an outlet. There are other features that are worth noting on the IndieGoGo page. You can pre-order one with as little as a $169 investment. Oh yeah…the Coolbox is also a spacious toolbox to hold a lot of tools. Be sure to check out the video below. When you do what you want to do, honestly and squarely, it does not at all deserved to be called work, but is the most splendid part of play, and every day is a holiday. Hands-on, technical skills aren’t being taught and encouraged in the U.S. public education system as they once were. So it’s up to parents, grandparents, and potential employers to fund and provide a basic understanding of woodworking and provide practical training. After all, not all kids are destined nor want to go to college. These creative individuals are bright and want to create with their hands, so it’s up to us to point them in the right direction and encourage their efforts. One way to do this is to get kids into the workshop. 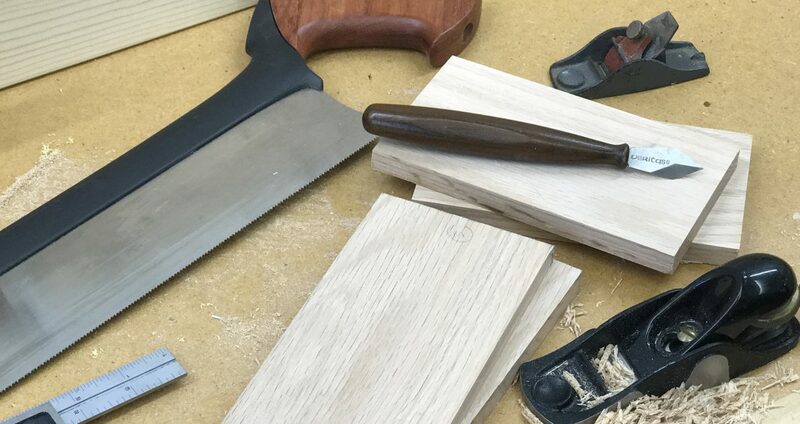 Whether you’re a hobbyist woodworker or run a production facility with dozens of employees, letting kids see, smell, touch, and hear in a woodworking environment can spark their interest and imagination. If you have a home shop, invite kids in. Show them how the tools work. Let them pound a few nails. Show them how a hand plane can put a glass-smooth finish on wood. If you run a production facility, have an open house and invite local schools and homeschool families to schedule field trips. Give students a tour of your facility. Show them how projects start in the design department, are manufactured, then finished and shipped. Let them watch a CNC machine in action. Explain how computers and technology can be used in a woodworking environment. Invest in the lives of kids in your area. They could be your future employees. You can change the direction and life of a child. I took care of my kids when they were little and they liked woodworking. When I followed them into school, as a volunteer, I found other kids like woodworking too. Not only did I find I liked working with kids, I ended up working at a Montessori School teaching shop (including woodworking with kids) to 4-6 year olds. And I worked for the parks department teaching working to kids ages 5-12. It was the most interesting, fun and meaningful woodworking I’d ever done. I went on to write two books (see affiliate links below). Jack’s books show how to use hand tools to build simple projects that kids can easily finish. In the end, the projects may not be worthy of entry at a woodworking show, but that’s not the point, is it? The goal is to help them develop their skills working with their hands and being creative with their minds. Jack maintains a web site, Woodshop4kids. Go check it out. Start thinking about how you can help kids in your area develop their skills and creative talent. You’ll be paying it forward. And that’s a good feeling.